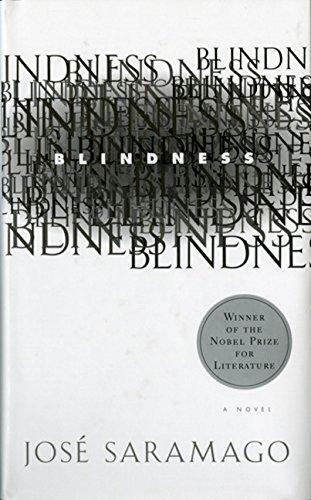 Few things frighten me more than the collapse of the society we take for granted, and few books have dug as effectively into this fear as José Saramago’s Blindness. What really makes it work, though, is that it toys with the idea that it’s not just society we take for granted…it’s the very way we perceive it. Well…it sort of does that. It does to me, at least, and this is one of probably few examples in which I think my own limited experience as a reader actually ended up being a benefit. 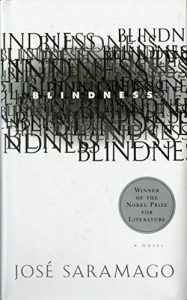 See, when I read Blindness, I was impressed. The thing that hooked me was its concept, which I thought–and still think–was great: a mysterious epidemic of sightlessness spreads rapidly from person to person. There is no explanation for what’s happening. There is no solution. One morning, people can see. The next, they can’t. Only one woman manages to retain her vision…for reasons nobody, at any point, will know. An author can do a lot with that setup, and Saramago, indeed, does. Blindness, naturally, is a story in large part about disorientation. Or, more specifically, about the immediate loss of orientation. And he authors his book in such a way that the reader feels something similar. We are used, after all, to certain conventions of fiction that Saramago robs from us: character names, dialogue tags, compact sentences, and assistive paragraph breaks. As a result…well…we’re lost, too. As the epidemic hits these characters–which happens at the precise start of the novel–we are thrust right along with them into a world we don’t understand. For them, it’s required that they find a new way to live. For us, it’s required that we find a new way to read. Dialogue is part of the narration. It’s never immediately clear who is speaking, or even that anyone is speaking. It’s embedded in the middle of a long paragraph, as opposed to set off on its own, with helpful punctuation, as it usually is. And the lack of character names makes it difficult for us to remember who is who…as though every character’s motives must be judged based solely on what they’re saying right now, because it’s difficult to build up a complete, identifiable history of behavior for them. Just as it must be for these characters, voices are only voices. We took structure for granted. When it’s removed…we don’t know how to read. The same goes for his seeming reluctance to end sentences. They instead stumble on and on, over and across various ideas that may sit next to each other on the page but aren’t necessarily related. He doles out full stops sparingly, leaving us to grasp at what we can while we go, hoping to eventually come to some kind of termination point that might help us to assess whatever it is we’ve just bumped into. We are blind characters groping along a wall full of unfamiliar–and perhaps unknowable–obstacles and decor. It’s an intellectually dizzying effect, and it’s a great one. It’s a masterful and efficient way of pulling the reader into the reality of the tale without resorting to cheap visual trickery (such as, say, printing certain text in a much lighter ink) or grabbing at visceral reactions (such as by describing, in detail, any number of the myriad tragically gory outcomes of a world suddenly plunged into sightlessness). No, instead Saramago is artful. Elegant, even. His tragedy unfolds with authorial grace and a remarkable understanding of his medium. See, here’s something I didn’t know, and it was only pointed out to me afterward, as I raved about it: these are common aspects of Saramago’s writing. The lack of character names, the indistinct formatting, the voices without attribution…that’s not Blindness. That’s apparently Saramago. And that, in itself, was an interesting discovery. Had I read Saramago for years, I would not have felt these things in Blindness. I came instead from another author, one who, at least comparatively, adhered to recognizable, tacitly agreed upon fictional structure. The first page of Blindness, then, drained from me the comfort of orientation, which, of course, was something I could not expect. His longtime readers, though, had experience with it. This was just how he wrote, and they grew to love him, to understand him, to know how to follow him. They knew how to read him. I feel a little bit bad for them. Saramago may have played the same tricks regularly, but they suit Blindness perfectly. It’s the right story for them…and, in return, they are the right way to tell this story. I don’t mean to suggest, nor could I possibly suggest, that they didn’t work as well with Saramago’s other novels. But I will say that as someone who’s only read Blindness, it is impossible for me to imagine using them for any other reason. They feel as though they were conjured from the aether expressly for this purpose…whereas the truth is that they evolved over time, and their purpose came instead to find them. It’s the nearest thing to a clear intelligent design / natural selection dichotomy as I’ve ever known in literature. It’s interesting how that works. How artists do something for so long, and then, at once, it clicks in a way it never had before. They’re not even necessarily doing something different. They’re just doing what they love, and, suddenly, things matter. Think of Wes Anderson going from Bottle Rocket to Rushmore. Think of the distance between Help! and Rubber Soul. The gifts of the artist are the same, but a new context is found. One in which everything takes on a profound new significance. One in which quirks and habits and hobbies become defining characteristics. One in which words become a voice. I got to experience something with Blindness that his fans did not. Often a greater understanding of an artist can enhance our appreciation for his or her works. With Blindness, though, ignorance really was bliss. Whenever Saramago pulls those tricks on you for the first time, you’ll be surprised. But you’ll only be surprised for the first time. I’m glad that my first time was the right time.